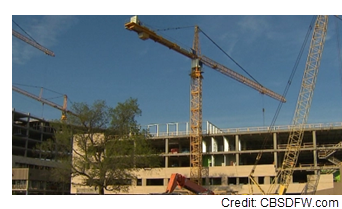 ​​ FRISCO – Construction on the new Texas Health Hospital Frisco hit the halfway mark in July 2018. When complete, the 325,000-sf facility will house 140 beds, a brain institute, cancer center, state of the art rehabilitation center, and pediatrics unit. The $270 million project is scheduled to open in fall 2019. The new 20-acre hospital and medical office campus is a collaboration between Texas Health and UT Southwestern Medical Center.